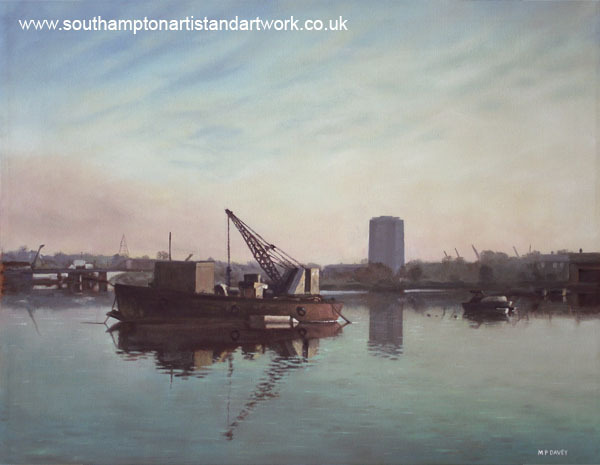 This oil painting depicts the area of Northam, Southampton. It is the river Itchen, facing in the direction of Southampton. On the sky line can be seen cranes and in the centre can be seen the tower block that is a landmark of the area. On the left is the Northam Bridge, one of the first pre-strested concrete bridges, built in the 1950s. The view is from the local boardwalk. The image is based on a photograph, and was a very cold and sunny day, quite late, during the winter months. The water was particularly still, like a mirror. The crane has since been removed. The area is quite popular with photographers and although not a pretty location is still visually interesting. Painted on a 16" x 20" canvas.